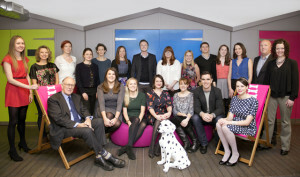 Award-winning B2B communications consultancy Man Bites Dog has been recognised as one of PR Week’s Best Places To Work for the sixth consecutive year. The award followed a panel interview with judges from PR Week, the PRCA and the Chartered Institute of Personnel and Development. Man Bites Dog was awarded the silver award this year, having won gold for the past five years, with judges praising the consultancy’s culture, industry-leading staff retention and commitment to training and personal development. They also noted the more imaginative perks that keep Man Bites Dog ahead of the pack, including socials and annual European weekenders. Managing Director, Claire Mason, said: “It’s a real honour to be recognised as one of PR Week’s Best Places to Work for a sixth year. While we invest in great perks, for Man Bites Dog being a great place to work is all about the things that money can’t buy: a uniquely supportive culture, caring about each other, continuous learning, and working with some of the world’s smartest companies. The win follows a strong year for Man Bites Dog, which won B2B Marketing’s PR Agency of the Year for a third time. Claire Mason was also named Female Marketing Leader of the Year by the Chartered Institute of Marketing.